The state of the art facility is the first of its kind in the area. The project has over 16,000 yards of concrete paving and construction. It has required 200 yards per hour of concrete production. Having a massive subterranean scale, on and off ramps, an inspection building, and weigh in motion sensing scales. 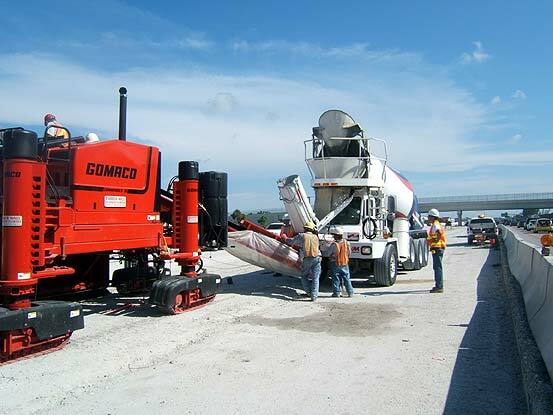 The project consisted of concrete pavement repairs over a 5-mile section of the Orlando I-4 Interstate. It was necessary to perform all concrete placements off hours in the early mornings. Lane closures to vehicle traffic had to be kept to a minimum and would require concrete placed to meet an early strength that would allow traffic lanes to be opened within a 3 to 4 hour period. The new pavement poured would then reach strength over 10,000 psi within a 28 day period. Through Archer Western and their sub-contractors we supplied over 19,000 cu. yards of DOT concrete. The project pours included barrier walls, auger cast piles, slip form, bridge deck and mass concrete foundations. We met the challenge of Archer Westerns tough schedule demand to help them complete this project ahead of schedule. West Palm Beach Clear Lake on Okeechobee Blvd. We have teamed with Community Asphalt on several DOT projects throughout the years. This featured project required approximately 4000 yards of Flowable Fill to repair water erosion and set new pipe. Although this was not a large pour it required challenges in timely placement. 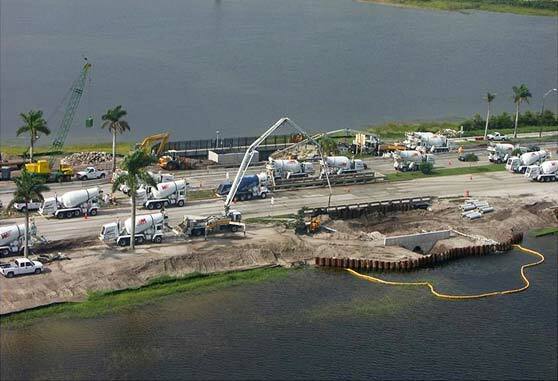 We produced 460 yards per hour and placed concrete by feeding through two pumps and straight out of the trucks. Specializing in electrical construction for, traffic signal systems, highway lighting, bridge electrical systems, navigation and airport lighting. We have teamed with The Signal Group on a range of FDOT projects from the Interstate highways to Local streets with Drill Shaft for road signalization. Our team is ready to respond at any time of the day with after hour availability when needed.